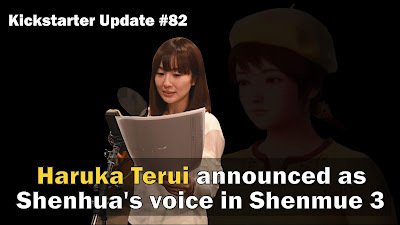 In this post we comment on the announcement of the Japanese voice of Shenhua for Shenmue III as Haruka Terui and analyze the photos that accompanied the update. This post was available 7 days early to patrons. 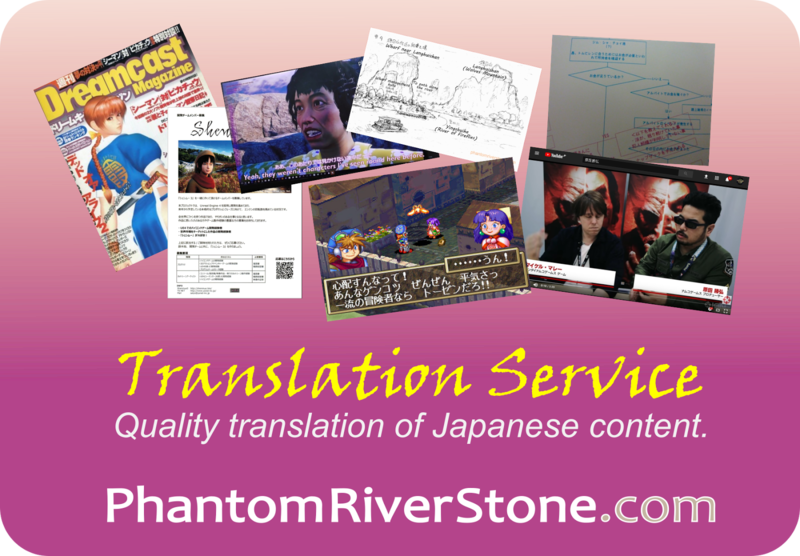 Support Phantom River Stone on Patreon to receive early access to posts and other rewards and help us keep making content like this! "Shenmue has been beloved by so many for so long and fans have been waiting her. As I look Shenhua in the eyes and become her voice, I will remember everyone has their own precious memories and I will do everything I can to keep those memories like they were." 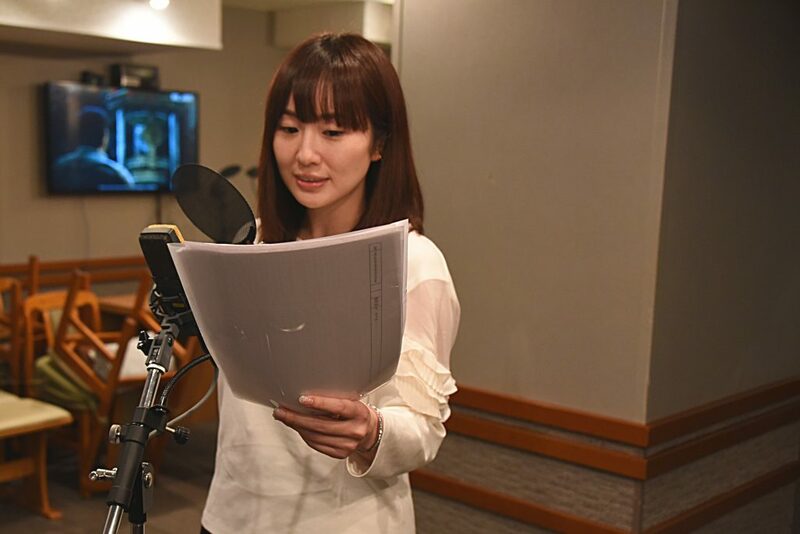 The reason a new actress was needed is that the one who voiced Shenhua in the first two games, Hazuki Ishigaki, was not available due to her retirement at the start of 2005. 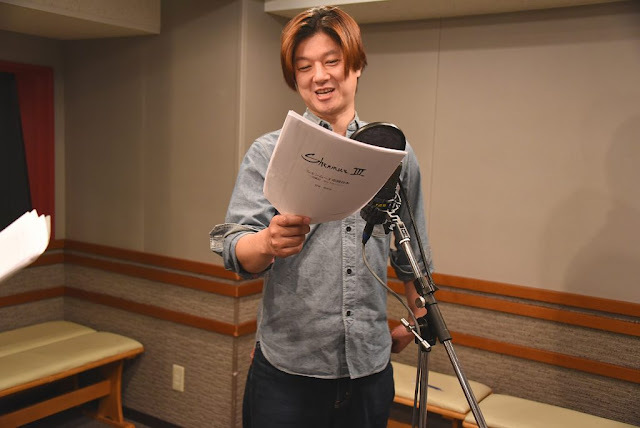 "After giving it my utmost consideration, I'd like to find a new path for myself..."
How will the new voice of Shenhua sound? The update does not include any audio, but among the audio samples that can be found on the website of Haruka's agent, the following voice sample in particular strongly evokes the poem Shenhua narrates in the prologue of the first two games. The update also has several photos taken at the recording studio. 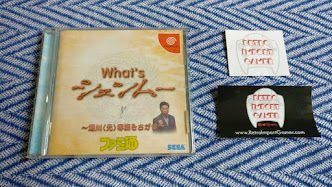 The game's logo (as designed by Yu Suzuki) can be seen on the script held by Masaya Matsukaze. The cover of the script he is holding also contains a few lines of text, but unfortunately the resolution of the photo is not high enough to read all the characters clearly. An improved-resolution image has been obtained and the circled text has now been figured out! Read on for the details. 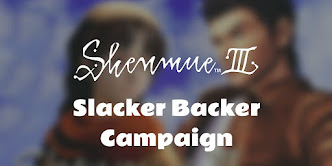 Apart from the logo itself, the clearest word that can be made out is a repeat of the game's name "Shenmue 3" in the line beneath the logo, and what could possibly be "Bailu village" on the line below that - this is a calculated guess based on extremely blurry characters however. The last line, which is likely to be the creator's name, consists of three kanji characters, which nicely fits the characters for "Yu Suzuki". Thanks to the help of ヤマ岸マン and Spaghetti on Twitter, we have been able to decipher these text lines completely. 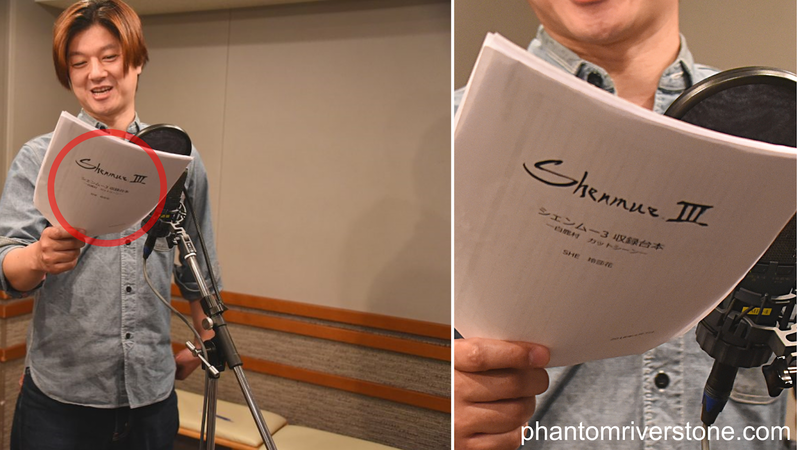 The translation of the three lines of text reads: "Shenmue 3 Recording Script", "Bailu Village Cut Scenes" and "SHE Shenhua Ling". 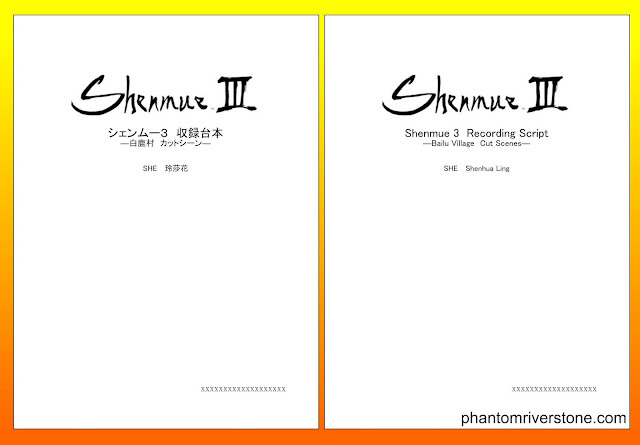 Reconstruction of the cover page of the script held by Matsukaze-san (left: Japanese original, right: English translation). Initially I assumed that "SHE" is an acronym relating to the script or sound recording in some way, but initial investigations did not turn up anything suitable. A few people have put forward the suggestion that "SHE" represents an ID assigned to the character of Shenhua for the game's development, and this seems the most likely explanation. 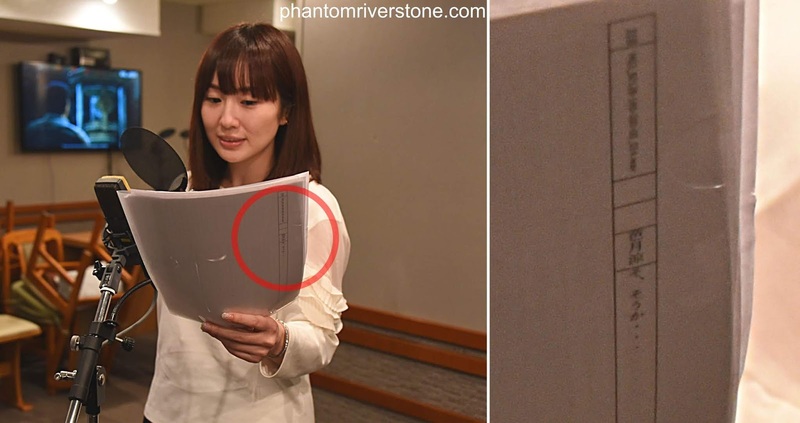 The script held by Haruka also contains a small amount of text, which turns out to be the final line of a cut scene. Ryo Hazuki: "Oh... 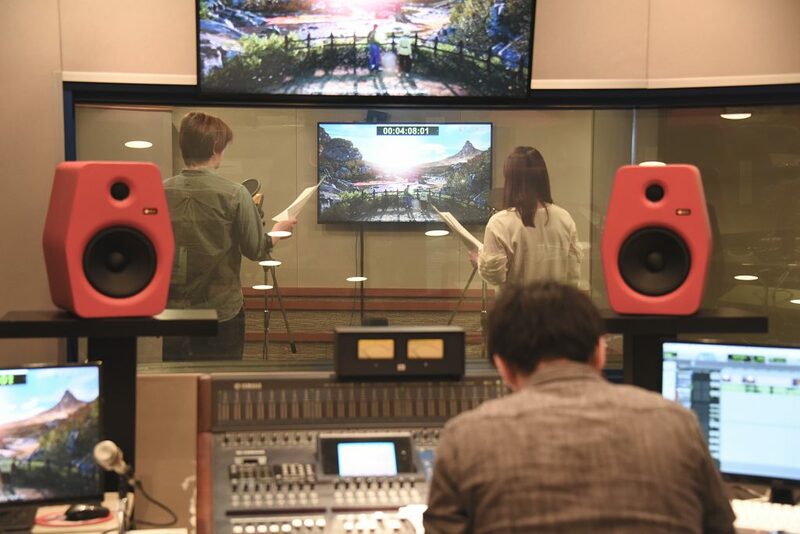 I see..."
The next photo shows Masaya and Haruka together in the recording booth. The scene displayed on the monitor can be recognized as the location from the teaser shown at Gamescom where Shenhua points ahead towards Bailu village. 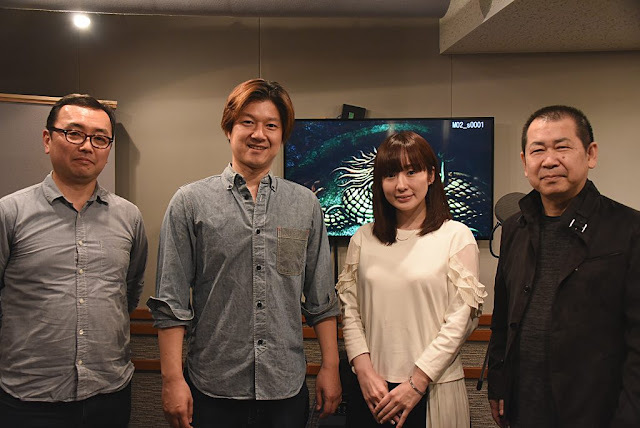 Next is a group photo that includes the sound director, identified only as "Nakamura-san" in the update; more specifically this is Takayuki Nakamura who is a game music composer and musician who has worked on many titles including Virtua Fighter and Daytona. Notice also the image on screen, which shows part of the dragon design on the wall of the cave during the end scene of Shenmue II. From left: Takayuki Nakamura (sound director), Masaya Matsukaze (voice of Ryo), Haruka Terui (voice of Shenhua) and Yu Suzuki (game director). Finally, if we look again carefully at the monitor in the background of the first photo of Haruka, there is an indistinct scene shown. Eagle-eyed fans (such as our friends at Shenmue Master) were quick to spot that this is also from the ending scene of Shenmue II, showing the pillar that rises from the floor of the cave, into which Ryo fits the Pheonix mirror. 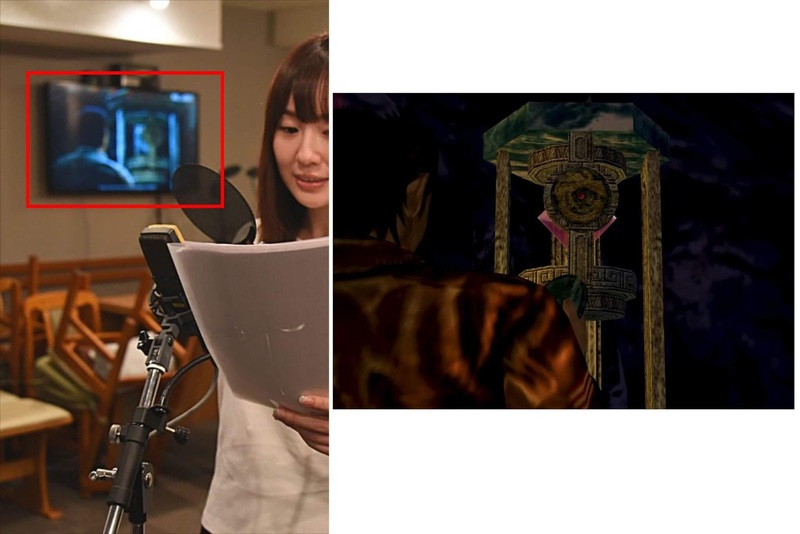 These clues indicate that we are seeing voice work recording for part of this final Shenmue II scene, which points towards a reconstruction of the final cut scene being included in Shenmue III. Some questions that spring to mind are: will this cut scene be reconstructed in its entirety? Will it be playable? From what point will game play begin? This update has provided fans with plenty of new talking points for discussion until the next one. Let me point out one tiny thing, though. Shenhua's family name should be "玲" not "鈴" in Kanji. Thanks for catching that Kiyuu! I'll make a correction. Good to hear from you.